Rahvaalgatus.ee – yet another e-platform for civic engagement? No, a process of democratic renewal instead! Is there e-democracy in e-Estonia? “There is no e-democracy in Estonia!” has said Robert Krimmer, the Professor of e-Governance at the Tallinn University of Technology. Can that provocative quote hold true in the digitally witty and globally known e-Estonia? Unfortunately it can, as has shown the two years of maintaining the citizen initiatives platform rahvaalgatus.ee, along with the citizen education work around it. The thing is that the e-state is so far only service-based – e-elections, e-government, e-health and so on –, but e-democracy as described through everyday relationships between citizens and public servants, using crowd wisdom in policy-making, engaging more people in solving societal issues, protecting the rights of the underprivileged, contributing to openness and transparency of state and local governance is much more than a public service. There are also voices saying that the outdated model of public service hinders the further success of e-Estonia. Nevertheless, the yet unrealised potential of e-democracy can be taken as an opportunity for deepening collaboration between the government sector, openness advocates and social innovators working towards the common goal of renewing governance and democracy. Here are some proofs of the poor state of e-democracy of Estonia through the lenses of the platform rahvaalgatus.ee, set up and maintained by the non-government competence centre Estonian Cooperation Assembly. Rahvaalgatus.ee (direct translation: citizens’ initiative) is a digital infrastructure for collective proposals addressed to Riigikogu, the Parliament of Estonia. The collective addresses right emerged in 2014, deriving from People’s Assembly back in 2013. One of the aims of the nation-wide deliberative democracy experiment was to propose more possibilities for citizens to engage into policy-making between (and in addition to) elections. 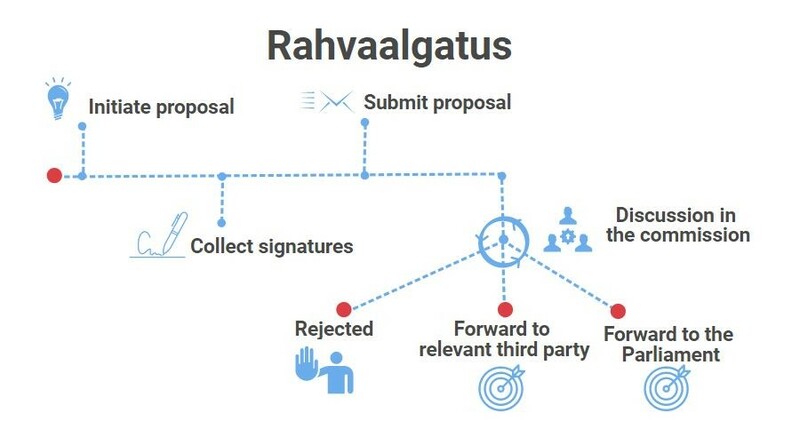 Rahvaalgatus.ee, enabling to discuss on and co-create initiatives, collect digital signatures, send initiatives to Riigikogu, and follow-up what happens to them, was set up by the state-funded foundation Estonian Cooperation Assembly in collaboration with the Chancellery of Riigikogu two years later, in 2016. If we watch back how e-voting was introduced in Estonian society, we can proudly confirm that the amount of e-votes collected on rahvaalgatus.ee throughout the first 20 months are bigger than e-votes collected during the first e-electionsof Estonia (by the way, we are still the only country in the world to enable e-elections). This indicates that rahvaalgatus.ee follows similar patterns of technology adoption. During the two years of operations, 16 initiatives have reached the parliament through the platform (in total 31 since 2014), more than 30 proposals still gathering signatures. While many discussions are in progress, one collectively proposed problem has been solved with the help of the Parliament: protecting the habitat of the flying squirrel. Some of the other raised issues have been solved by ministries or are still under discussion. At rahvaalgatus.ee we do not count the success rate by draft acts initiated or changed but by assessing whether the problem raised was solved or whether the submitted proposal got adequate feedback. In the world of e-participation, rahvaalgatus.ee is nothing special: a simple beta-platform that is constantly developed on the basis of user feedback. Around the technical features we work with spreading the word about this civic right as well as reach out to important engagement and co-creation processes that result with proposals or manifests to the parliament. Among others these kinds of “bee nests” are the annual Opinion Festival gathering hundreds of discussions on vital topics, advocacy networks like the youth and environmental organisations. We collaborate with researchers, public servants, think tanks and civic organisations to find solutions for identified systemic gaps, like the low digital literacy of young people, in the never-ending work with (e-)democracy. If compared to other participation platforms – the public consultation platform, the government’s engagement platform or the popular petitioning platform set up by Owners´Association – no other e-tool has that kind of user-friendly approach supported with systemic work with (potential) users and stakeholders responsible for inter-linked processes. This is why it is easy for rahvaalgatus.ee to be the forerunner of (e-)democracy in Estonia, Europe and the world (modesty does not suit Estonians). We dare to say that because of the endless admiration by the international audience, take for example Nesta’s report “Digital Democracy”. As the most fulfilled commitment of the Estonian OGP during 2014-2016 (lets hope there will be more! ), we continue setting example with rahvaalgatus.ee. Currently we are working on spreading rahvaalgatus.ee to the local level for enabling the existing right of the 1% of voting-age citizens to submit a proposal that the local council needs to address. Participatory budgeting has spread to more than 15 municipalities in Estonia, so the timing is right for more user-friendly possibilities for civic co-creation and crowd wisdom in communities and localities. What is hindering the public participation innovation is the vicious circle of distrust. The collective addresses can result in solving the issue by the Parliament or concerned ministries, in a state-wide important discussion, in new proposals, draft acts or suggestions to change existing legislation. Still, so far the 30+ collective addresses have not had a measurable impact on how the Estonian society is being governed or problems solved. That is we – the tiny office of the Estonian Cooperation Assembly together with many partners – are now working with the results monitoring. We are currently setting up a follow-up mechanism of initiatives. This means engaging advocacy groups working with the topics of initiatives, trying to automate the parliament’s info exchange, knocking on the conscience of parliament’s commissions before the discussions of proposals, attracting data journalists’ attention to reflect upon the results of collective initiatives, encouraging advocacy groups and engagement experts to evaluate the proceeding of citizen initiatives. Now processing of citizen initiatives ends like shown below. Lets hope we will manage to get it further illustrated, showing the real results and impacts. While working on strategic models for rahvaalgatus.ee, we have initiated a wide collaboration network of change makers and openness advocates. The common purpose is to renew the governance models, educate citizens on everyday democracy and facilitate systemic changes based on crowd wisdom. Check and support the Democracy Lab idea on the Advocate Europe call for ideas!